Dustin Poirier led all the fighters for salaries earned at UFC on FOX 29 from this past Saturday night. Dustin Poirier left Arizona with a fourth round knockout win over Justin Gaethje and the biggest payday for any fighter on the UFC on FOX 29 card. The salaries for the event were released on Monday via the Arizona Boxing and MMA Commission. 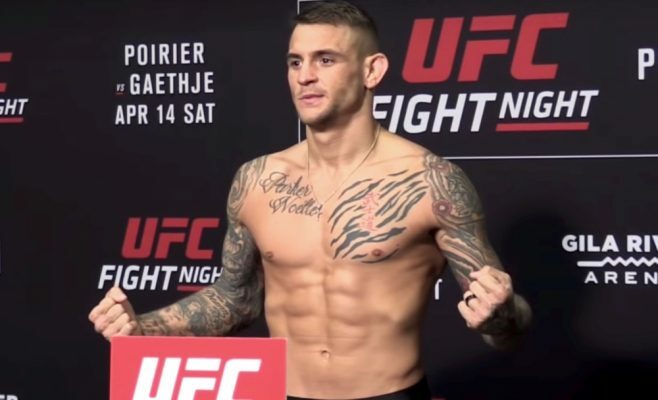 Poirier earned $170,000 for his win over Gaethje plus he took home an extra $50,000 for his part in the ‘Fight of the Night’. Gaethje was just behind Poirier with $110,000 earned plus he also reaped the benefits of that $50,000 bonus for ‘Fight of the Night’. Alex Oliveira certainly made the most of his short notice opportunity to take on former UFC interim welterweight champion Carlos Condit at UFC on FOX 29. Oliveira not only picked up a submission win over Condit after taking the fight on just two weeks notice, but he also took home $100,000 for his win plus another $50,000 for one of the ‘Performance of the Night’ bonuses. Here are the full salaries for UFC on FOX 29 from Glendale, Arizona. Justin Gaethje: $160,000 — $110,000 plus $50,000 for ‘Fight of the Night’.